In our previous post about semi-automatic pistols, we noted that while such a pistol is capable of shooting several times before reloading, the user needs to pull the trigger every time to take a shot. Now, we will study another class of pistols, where the weapon fires multiple times when the trigger is pulled and held down: the machine pistol. These weapons are capable of fully automatic or burst fire, unlike the semi-automatic pistols in our previous post. Some of these weapons are also capable of switching firing modes between single shot, three round burst mode and fully automatic modes. In an earlier discussion about the differences between a rifle, SLR, submachine gun, carbine etc. we noted that submachine guns have similar features to assault rifles (i.e. capable of fully automatic fire, selectable firing modes, detachable magazine etc. ), but use pistol ammunition. So then, what is the difference between a machine pistol and a submachine gun? The difference is indeed very hard to define, but it is now commonly accepted that if the automatic design was scaled down from an assault rifle to a weapon that fires pistol ammunition, then it is a submachine gun. If the original design was a semi-automatic pistol that was redesigned for full-automatic mode, then it is a machine pistol. Some of the early semi-automatic pistols, such as the Luger P-08 and the Mauser C-96 were modified to produce automatic versions, so the concept isn't exactly new. After World War II, the Russians introduced an automatic pistol called the Stechkin VPS, intended to be used by artillery and tank crews. Due to its weight, it was gradually phased out of regular service. Another two examples of a machine pistol would be the Ingram MAC-10 and MAC-11, which we studied when researching straight blowback actions. One of the main issues with any weapons firing multiple shots (not just machine pistols alone) is the tendency of the muzzle of the weapon to rise when shooting. We already studied the cause of this phenomenon earlier and some ways to counteract this. Most of the early automatic pistols like the Luger, Mauser and Stechkin came with a detachable wooden stock, which could help steady the weapon better to counteract the muzzle rise. This weapon had an optional plastic stock that could be attached to the back of the pistol. The selective fire control was located on the optional stock and could select between single shot and 3-round burst modes, as can be seen in the top picture above. 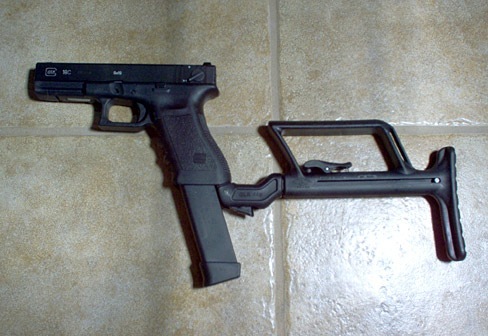 With the stock attached, the user could switch between the modes as desired, but if the stock was not attached, the pistol would only fire in single shot mode. The stock provided a higher degree of stability and accuracy and therefore made it easier to keep it pointed on target when firing multiple shots. Yet another model is the Glock 18, which came out in the 1980s. The Glock 18 is a variant of the Glock 17 semi-automatic pistol, which is capable of selective fire in either single shot or fully automatic mode. Note that this model has an extended magazine, capable of holding 33 cartridges. It also has a lightweight folding stock. It works around the problem of muzzle rise by having vents in the front of the barrel, which act as compensators and push the muzzle downwards. Glock 18 models are only intended for military use and are not normally available on the civilian market. In the late 90s and early 2000s, Stechkin VPS pistols made a comeback, mostly used by personal bodyguards and special forces units.